Aroma: Very sweet. Caramel, light oak – and banana. Yes, banana. Taste: Nice complexity. Sweetness at first, then a wave of spice – cinnamon and nutmeg – along with a minty fire that will last into the finish, which is long and bold. Verdict: This Kentucky Bourbon Distillers product – a Double Gold Medal winner at the World Spirits Competition in San Francisco in 2010 – is a great value at about $25 for the 750ml bottle. It will definitely warm you on a cold winter’s night. After sipping it neat, I decided to open up the flavors and tamp down the fire a bit with a big ice cube. My favorite by far. Spicy, complex, peppery and cheap. Dining once in Bardstown, I struck up a conversation with the barkeeper. He told me a local bourbon club comes in on Thursday nights and drinks $700-$800 in bourbon. 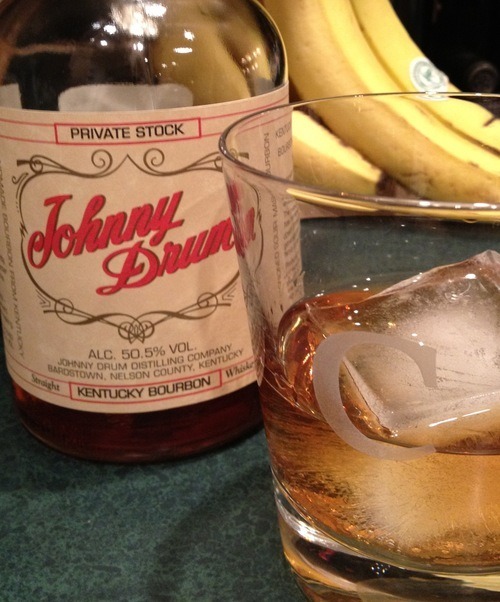 He said they always start with a glass of Johnny Drum. That got me started. At the time it was not available in Tennessee. I once drove to Kentucky and bought six bottles. Now I’m in Colorado and Johnny Drum is available there. Go figure.